The Christian Church is adapting itself to the secular world in almost all areas. It has been remarkably successful in covering its tracks on its traditional teachings. Modern Christians outside the most conservative Christian communities generally have no idea what traditional Christian teachings were on subjects such as capital punishment, torture, slavery, women's rights, "mixed" marriages, freedom of belief, anti-Semitism, and so on. The trick is done in to ways. The first is to rewrite history to make Christians the good guys - we all learn in school about Christian reformers, rarely do we hear that they followed generations of non-Christian reformers or that the few Christian reformers spent their lives fighting opposition from the majority of their orthodox brethren. The second is to remove the evidence. Hardly any Inquisition records survive. Trial records disappear. Compromising letters get lost, or edited. Torture chambers get turned into innocuous well-lit offices. Teams of Christians work night and day to ensure that Wikipedia gives a view slanted to the benefit of the Church. There are a few areas that the Churches have not yet cleaned up, and others that the Churches started to clean up only after the invention of photography. The process started late in particularly religious countries like Catholic Spain. Spain is around a generation later in the process than northern Europe. So it is that Catholic priests, monks and nuns are still involved in various forms of traditional animal torture from bull fighting to throwing live goats off church towers. 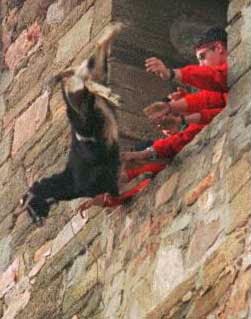 Goat throwing from the Church tower at Manganeses de la Polyvorosa, Spain, to celebrate the patron saint, Saint Vincent. One point of growing embarrassment is the national Saint of Spain. Santiago, Sant Iago, or Saint James, sounds innocuous enough, except that he is actually Santiago Matamoros, Saint James the Moor Killer. 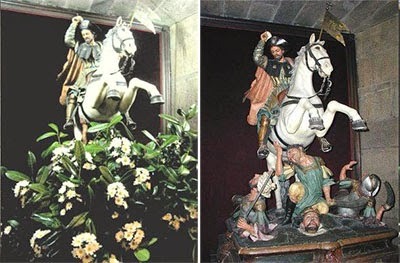 In Christian fantasy the heavenly saint fought alongside Christian forces against the Muslims at the Battle of Clavijo during the reconquista, cutting down and trampling God's enemies. Each year, festivals around the country feature brave Christian knights killing Muslims. A number of Mexican settlements were named Matamoros by Spanish settlers in honour of their patron saint. Perhaps the best example of a late survival of Spain's Christian past, concerns not Muslims but Jews. 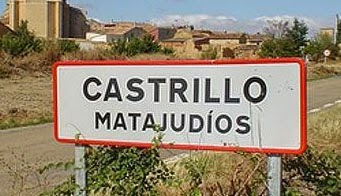 The mayor of a village called Castrillo Matajudíos is thinking of changing the town's name. Why might he think this a good idea? Because the name means "Castrillo Kill the Jews", apparently commemorating a Medieval Christian pogrom of Jews. The word Matarjudios, "Kill the Jews", features elsewhere in Spanish life. It is a common family surname, as well as the name of an Easter drink. Such cultural fossils present a problem to modern Christians trying to whitewash the Christian history of ingrained anti-Semitism. Anti-Semitic martyrdom tales have been dropped, anti-Semitic paintings, monuments and statues have vanished, anti-Semitic texts are no longer officially given an imprimatur, the anti-Semitic wording of Easter services was disretely changed in the 1960's. All we have left as a reminder of the truth is the name Matarjudios. Just in case you think I'm making this up, below is an article from the Guardian in 2014, giving a bit more background. After living with the name for more than 500 years, the village of Castrillo Matajudíos (Castrillo Kill the Jews) looks set for a change. This week the 60 residents of the village in northern Spain will vote on a proposal put forward by the mayor, Lorenzo Rodríguez, to revert to what is believed to be its original name, Castrillo Mota de Judios (Castrillo Jews Hill). It apparently acquired this name in 1035 when Jews fleeing a pogrom in a nearby village took refuge on the hill. "The people of [nearby] Castrojeriz took up arms against the king's emissaries, killed five of them and 66 Jews, while the rest were banished to Castrillo, which became known as the Mota de los Judios," the mayor told the local newspaper Diario de Burgos. After Jews were expelled from Spain in 1492, "someone wrote that now we're more Christian and decided to change the name from Jews' Hill to Kill the Jews," Rodriguez said, adding that it was important for people to understand "our roots" before reaching a decision on the name. There is a local tradition in the Castilla León region of drinking matar judios – a mix of wine and lemonade – on Good Friday. Matarjudios still exists as a surname, as does the more common Matamoros (Kill the Moors). The patron saint of Spain, Saint James of Compostela, is also known as Saint James the Moorslayer. Legend has it that his disciples brought his relics in a stone boat from the Holy Land to Galicia, in north-west Spain. This was about 100 years after Muslims conquered Spain. Saint James became the symbol of the Christian reconquest, which lasted 800 years and ended in 1492 with the fall of Granada and the expulsion of Jews. Muslims were expelled shortly afterwards. As the announcement from Castrillo Matajudíos came during the first days of the Passover holiday, there was no immediate response from Spain's Jewish leadership. But a Jewish American who has lived in Spain for many years but preferred not to be named told the Guardian the debate reflected an entrenched historical antisemitism in Spain. "Frankly it doesn't surprise me that there's a village called Kill the Jews, though it's pretty disgusting that it's taken them till now to think it might be a good idea to change it. There's a casual racism in Spain that no one here seems to notice but which is quite shocking to an outsider. People say 'he's a bit of a Jew' and stuff like that and no one seems to notice. Plus Spain is in complete denial about its Jewish and Muslim history." Jews arrived in Spain 2,000 years ago, and until the rise of the Inquisition in the Middle Ages Spain had one of the largest Jewish communities in Europe. They were tolerated by the Romans but persecuted by the Christian Visigoths who conquered Roman Spain. The Visigoths introduced forced conversion as early as the 7th century. As a result, when the Muslims invaded in 711 they were embraced by the Jews who helped them to drive out their Visigothic oppressors. A period of religious tolerance, unheard of anywhere else in Europe, ensued, with Muslims, Christian and Jews living in relative harmony. However, the plague that swept across Europe in the 14th century was widely blamed on the Jews and in 1391 there were pogroms in all of Spain's major cities, leading to an exodus and mass conversion to Christianity. Today there are only about 12,000 Jews in Spain, compared with 290,000 in the UK and 478,000 in France. In 2008 a survey carried out by the Pew Research Centre found Spain to be one of the most antisemitic countries in Europe. Yo! It’s getting real out here. The highly anticipated and highly coveted Air Jordan 11 Space Jam is less than two weeks away! Are you ready or what? With Christmas being right around the corner, perhaps a Space Jam 11 would be an ideal gift for the sneakerhead in your family, regardless of what size he/she Jordan 11 72-10 wears. The reason I say that is because the Space Jam 11s are set to come out in a full family size run. That’s right, from the smallest crib-size feet, to the big fellas who rock their shoe sizes in the high-teens. Jordan 11 Georgetown Everyone can get it, unless you have Shaq-size feet, if that’s the case, it looks like you’re out of luck. Prices for all sizes are as follows. If you’re able to fit into extended GS sizes (up to 9.5), then you’ll have an opportunity at picking up this luxurious Jordan 7 Tinker colorway of the Air Jordan 11 next month.Dubbed the Air Jordan 11 GS Heiress/Night Maroon, this women’s colorway of the Air Jordan 11 features a full Night Maroon upper that combines premium nubuck leather and velvet. Metallic Gold is then placed on the Jumpman logo by the ankle, and the branding on the tongue and heel. A White midsole and translucent Night Maroon outsole finish things off.The Jordan Eclipse Air Jordan 11 GS Heiress/Night Maroon is scheduled to release on December 17th for a retail price of $220. Who plans on grabbing a pair?